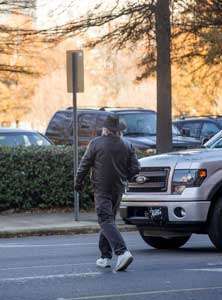 The hectic holidays may have many looking to save a few extra minutes wherever they can be found, but a University of Alabama at Birmingham expert says one seemingly small action—jaywalking—should be avoided at all times. In 2010, 4,280 pedestrians were killed, and an estimated 70,000 were injured in traffic crashes in the United States, according to the National Highway Transit Safety Association. Seventy-nine percent of these pedestrian fatalities occurred at non-intersections versus at intersections. Jaywalking is the illegal crossing of a roadway at a point other than an intersection or marked crosswalk, as well as walking against a pedestrian walk signal. David Schwebel, Ph.D., associate dean in the College of Arts and Sciences and professor of Psychology, studies pedestrian behavior. Schwebel explains that walking is just like driving—laws need to be followed for safety reasons. "Drivers wouldn't run a red light or dart their vehicles into an intersection when traffic is coming the other way, so why do some pedestrians feel that is OK?" Schwebel asked. "When you jaywalk, you are openly and blatantly breaking the law, which you don't usually do when driving near intersections, but many pedestrians feel it's justified." Schwebel says his research has shown that crossing the street is not as simple as it sounds. "To cross the street, you are processing a lot of information about traffic all at once: distance, speed, what drivers will do, how they will behave," Schwebel said. "There are numerous factors you must take into account in order to judge safety, and that's a lot for the brain to handle. Plus, many are talking on the phone or text-messaging, which can complicate the situation further." Schwebel says the situation is different when a pedestrian is at the intersection and crosses when the signal says go, because there are fewer variables. 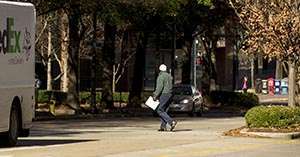 "We are all accustomed to the rules at crosswalks—crossing midblock where there is not a crosswalk is not expected, so it's harder to judge safety because you don't know whether drivers will slow down and stop as they normally would at a marked crosswalk," Schwebel said. In response to those who say jaywalking saves time, Schwebel says it is still not worth the potential danger. "The time you may save while jaywalking is not worth the risk," he said. "Plus, it's good for you to walk farther—both for safety and for health." Unless it is a medical emergency, Schwebel says, it is hard to see a justification for jaywalking. "Even if there is no traffic on the road, you shouldn't cross," he said. "Would you drive drunk when the road is empty?" Are distracted pedestrians a potential crosswalk hazard? Jaywalking law: A peculiarly American unnecessariness.